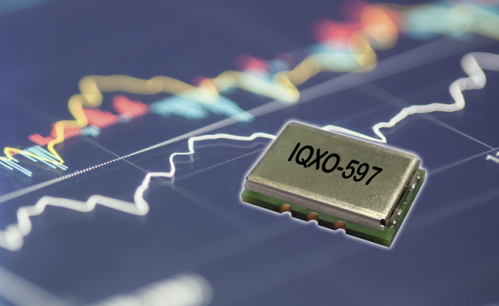 The new IQXO-597 range of clock oscillators recently launched by IQD has an ultra-high frequency range of between 1GHz and 2.2GHz. Housed in a 14.0 x 9.0 x 3.3mm, 6 pad, this surface mount package has an FR4 base with a non-hermetically sealed metal lid. The IQXO-597 is available in three different outputs; Sine, Differential Sine and LVPECL. With a tight frequency stability of ±20ppm over the operating temperature range of -40 to 85 degree C, this gives a maximum frequency deviation from nominal of just ±70ppm (including Frequency Tolerance @ 25°C, operating temperature range, supply voltage variation, load variation and 10yrs ageing @ 25°C). This new clock oscillator is ideal for applications such as 100G/400G data communications, high speed ADC, DAC & SerDes as well as coherent optical modules. The new oscillator is available in 3.3V with a maximum current draw of 70mA (Sine) or 120mA (LVPECL) and a ultra-low RMS phase jitter of 15fs over 12kHz to 20MHz (Sine @2.1930GHz) or 46fs over 10kHz to 20MHz (LVPECL @ 1.0960GHz). Packaging options are ‘Bulk’ or ‘Tape and Reel’ and detailed data sheets are available at www.iqdfrequencyproducts.com.